San Francisco, Calif. (April 21, 2017) – San Francisco real estate developer DM Development announces the newest addition to its growing, design-driven portfolio of projects, 815 Tennessee. The 5-story, 69-unit building will be open for sales in the Fall of this year and will be completed in early 2018. 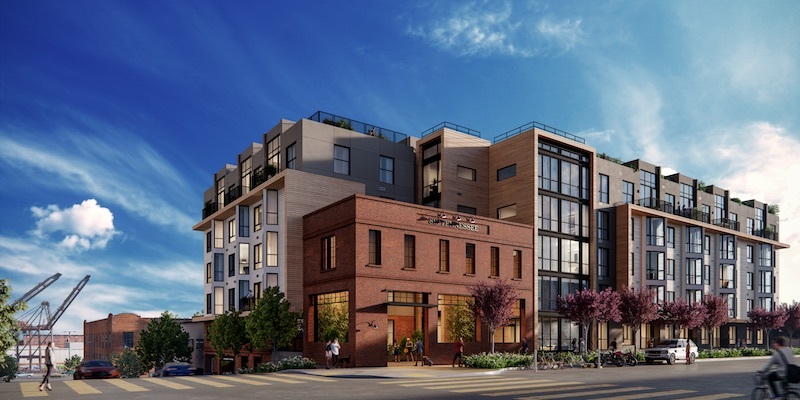 The project, which is located one block from the bustling Third Street corridor in Dogpatch will offer one, two and three bedroom units, a 4,500-square foot roof deck, ample parking, bike repair and storage areas, and a staffed lobby with a feature custom lit art wall. DM Development is building 815 Tennessee with financial partners Grosvenor Americas and First Republic Bank and marketing partner The Mark Company. The building architect is BDE Architects and the interiors are being designed by Edmonds & Lee, both of which are leading San Francisco design firms. 815 Tennessee is located one block from the Muni T line, Caltrain and the I-280 for easy access to downtown San Francisco, Silicon Valley, or other destinations within the Bay Area. The building is just two blocks from the popular Esprit Park, and close to the Third Street corridor, which was recently improved with bikes lanes and offers locally owned restaurants, bakeries, retail shops and art galleries. In a nod to the origins of the Dogpatch neighborhood, a historic façade has been incorporated into the design of the building, which bridges old and new with a mix of wood and steel and contemporary lines. Residences at 815 Tennessee are expected to start in the $700,000s. For more information and to receive early sales updates, please visit 815tennessee.com. 815 Tennessee is one of seven active DM Development projects in Dogpatch, Hayes Valley, the Marina and West Hollywood, which comprise over 506,000 square feet of development and 285 residential units valued at $474 million. DM Development is a real estate development and investment firm based in San Francisco. DM Development sets new standards for residential development by creating and investing in projects that combine bold architectural design with progressive sustainability features to enrich communities and redefine modern living. DM’s development portfolio of completed and in-progress projects include 8 Octavia, 400 Grove Street, 450 Hayes Street, Parcel T, 2290 Third Street, 815 Tennessee Street, 311 Grove Street, 2465 Van Ness Avenue, and 2301 Lombard Street in San Francisco and 702 North Doheny Drive in West Hollywood. For more information, visit: www.dm-dev.com. Grosvenor Americas aims to become a market leader in select geographical areas and sectors in Canada and the USA through focused, strategic expansion. Grosvenor uses its knowledge of the cities where it operates and its property skills to develop projects that contribute to the vibrancy and attractiveness of those communities. With particular interest in retail, residential condominiums and apartments, and mixed-use sectors, the Company currently operates in Washington, D.C., Seattle, the San Francisco Bay Area, Los Angeles, Vancouver and Calgary. As part of Grosvenor’s long-term commitment to contribute to the growth and prosperity of the cities in which it invests, it runs a Structured Development Finance program, which provides developers with project financing beyond conventional funding structures. The Program is successfully helping to increase the number of condominiums, rental apartments, mixed-use and single-family townhomes in supply-constrained markets around North America. As at 31 December 2015, Grosvenor Americas had assets under management of $2.7B USD. For more information, visit: www.grosvenor.com. The Mark Company is one of the nation’s premier urban residential marketing and sales firms. Founded by Alan Mark in 1997, The Mark Company provides a full range of core consulting services including analytics, design, marketing, and sales for urban high-rises and suburban attached properties throughout the Western United States. The firm is a trusted partner to global leaders in residential development and finance, providing buyer-driven sales and marketing strategies that produce industry-leading results. The Mark Company has represented more than 10,000 residences and generated over $5 billion in sales for the nation’s most notable and successful developments, including The Infinity in San Francisco, Evo in Los Angeles, and The Martin in Las Vegas. Current projects include San Francisco’s 181 Fremont Residences and Oceanwide Plaza Residences in Los Angeles. The Mark Company is a subsidiary of Pacific Union International, one of the nation’s leading residential real estate brokerages with 2016 sales volume of $10.15 billion supported by more than 1,100 real estate professionals across 38 offices in Northern and Southern California. For more information, visit: www.themarkcompany.com.